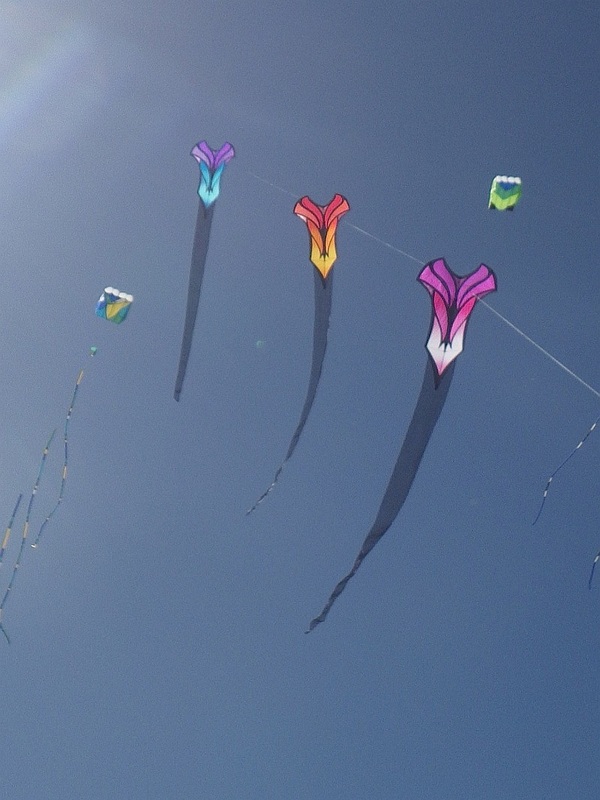 For example, a simple Diamond can have the flying line of another similar kite tied to where the spars cross. 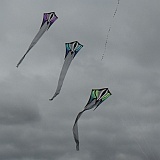 Then a third kite can be tied off to the second, and so on. 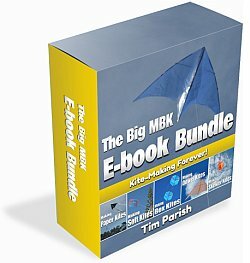 In the case of our little MBK 1-Skewer Diamonds (covered in the Making Skewer Kites e-book), the tie-off point is slightly below the crossing point. There's a photo of 2 of these in flight, further down. That's thin 12" bamboo BBQ skewers, by the way. Another approach with larger kites is to simply thread a flying line through a hole in each sail, near the towing point position. 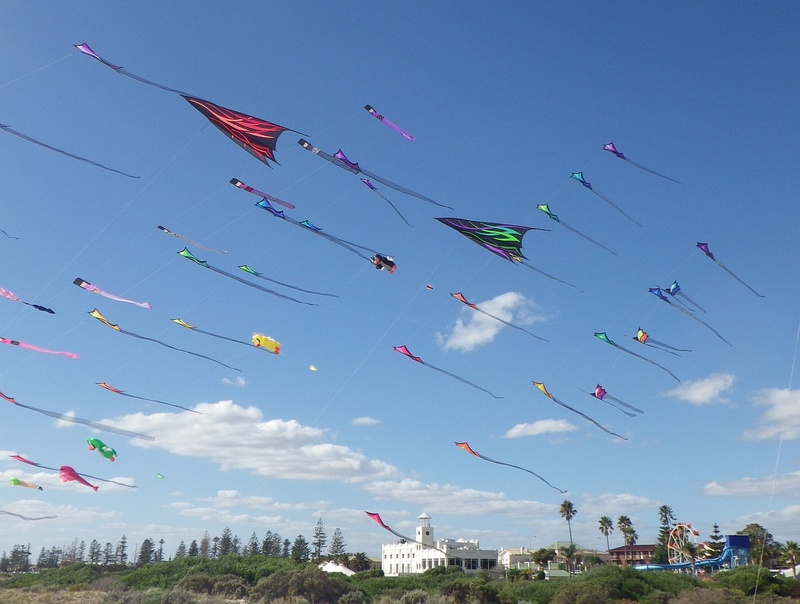 Of course, this requires that each kite be secured to the flying line somehow so it doesn't slip all the way up the line when in flight! For some, this means a 'pilot kite' flying on thin line right at the top. 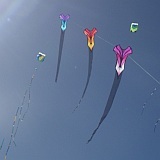 Others have tried spacing the top few kites a little further apart than the rest. 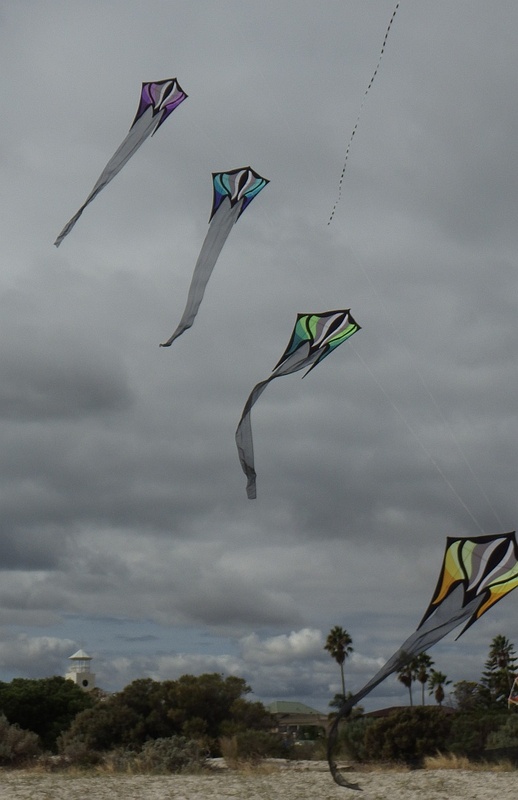 Personally, I like all the random gyrating of more widely-spaced kites. The more the better as long as it all stays up there! With very stable designs and smooth winds, the whole display can be almost static. In these cases the swaying can be quite subtle, with long slow ripples along the line's length. 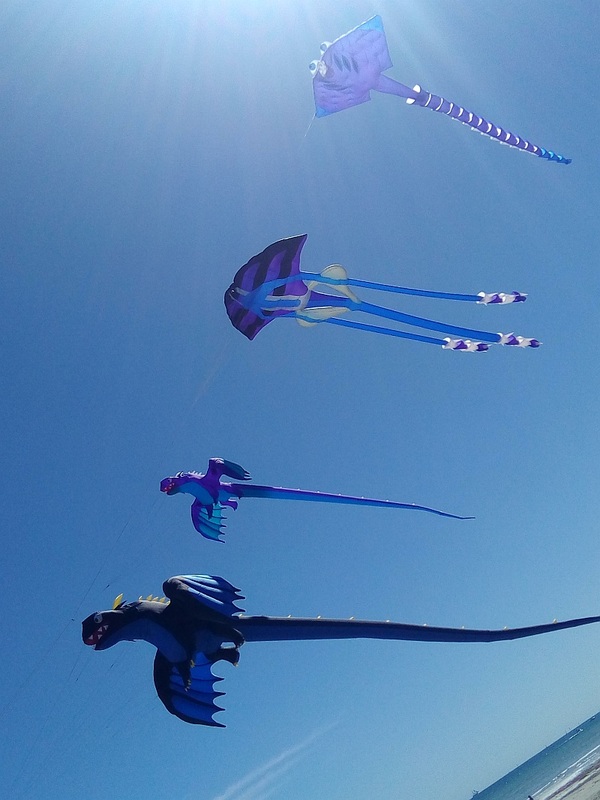 Peering back into the mists of time, the kites were large and the purpose rather more practical than just having some fun down at the beach. These early trains were all about carrying meteorological equipment, such as thermometers, up to various altitudes. More than a hundred years ago. Scientific Workhorses. 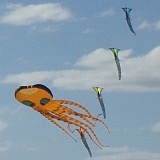 A century or two ago, large kites of several types were used to hoist scientific instruments into the air. 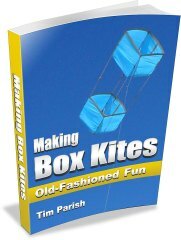 Hexagonals, Eddy Diamonds and various Box kite configurations. 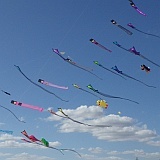 The multitude of kites on one line provided ample lifting power for this task. 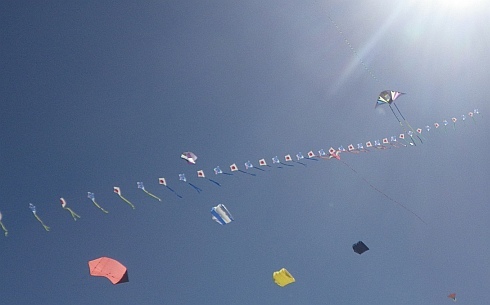 Also, taking simultaneous readings at various altitudes was a good fit for using a kite train. Temperature does go down as you go higher, they discovered! Man-Lifting Systems. 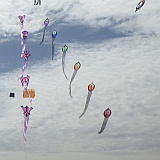 A few modern recreations of these old systems continue to be shown off at kite festivals around the world. 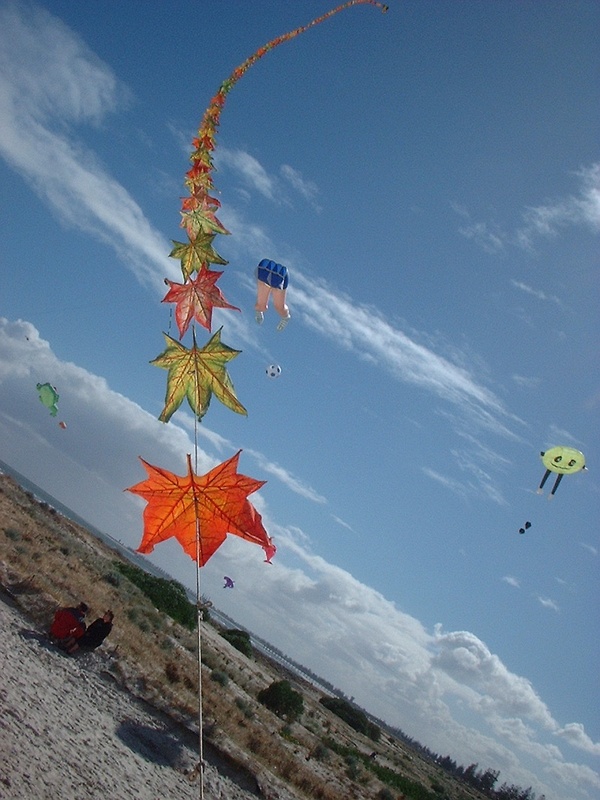 A Dutch team is known for demonstrating a replica of Cody's man-lifting system of Box kites. Would you be game to go up in the basket? Hobbyist Projects. 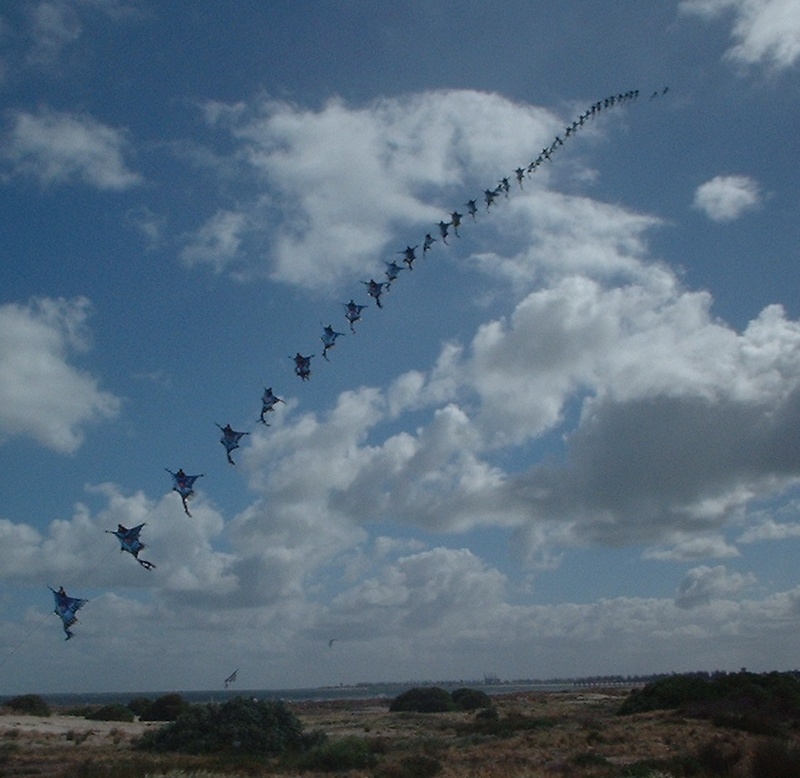 What was initially done for science looked like pretty good fun, in the eyes of keen kite fliers! 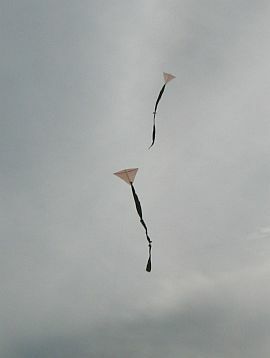 So it wasn't long before all sorts of single-line kites were being experimented with in this manner. Several Eddy Diamonds on one line would have been a simple and straightforward exercise. No doubt there were plenty of flat, tailed Diamonds as well, all shifting around in loose formation. This category persists to this day. 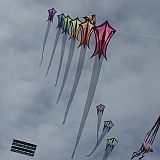 Heck, I've put up a few tiny Skewer Diamonds myself, all swooping around on a couple of hundred feet of 20 pound Dacron! There's a couple of them in the photo. 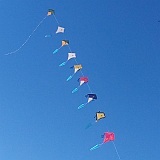 I've also done a kite train with tiny Barn-doors. Which brings me to a point - modern trains tend to employ rather smaller kites than even the amateurs put up in yesteryear. Traditional Asian. 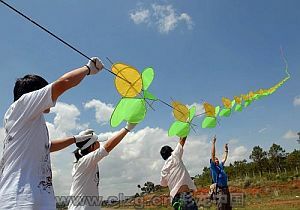 A good example is in Taiwan where kite masters fly huge long stacks of bamboo and tissue kites. 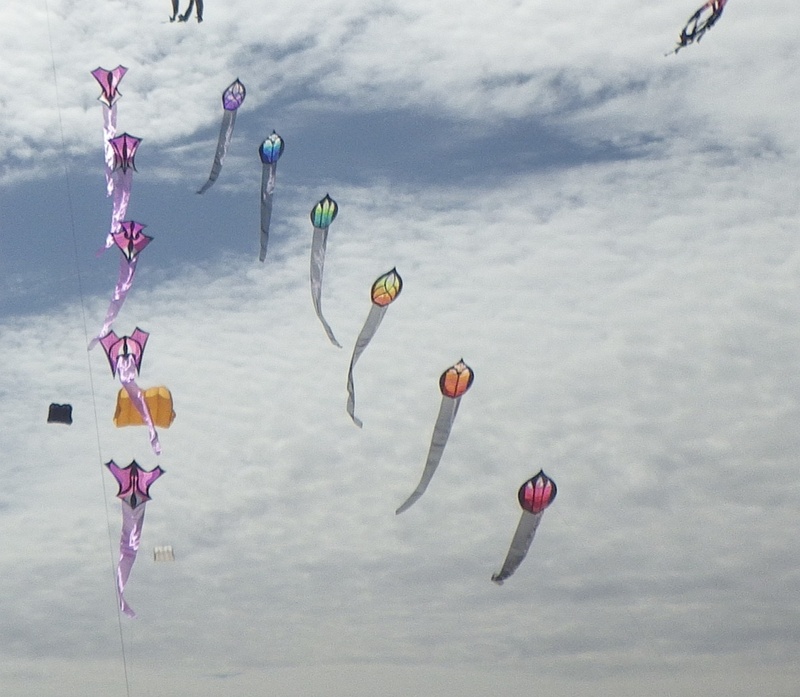 Having seen a couple of these first-hand at a festival, it was an amazing display of art, sheer kite performance and impressive wind range. The trains looked like steep pillars rising into the air and flew in all kinds of wind. 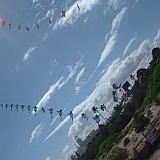 Even the flying line was of natural material. Rather thick compared to the equivalent strength in braided Dacron, but it certainly did the job. 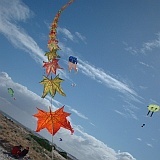 We took photos, of course, like the one here which featurs a realistic 'autumn leaves' kite train. Modern Novelty, Specialty or Art Trains. OK so that's 3 in one. What ties these sub-groups together is the expertise, quality and craftsmanship behind them. The example in the photo is Chinese, but there are other examples from all around the world. Perhaps the Chinese do it best though, when it comes to truly enormous projects! 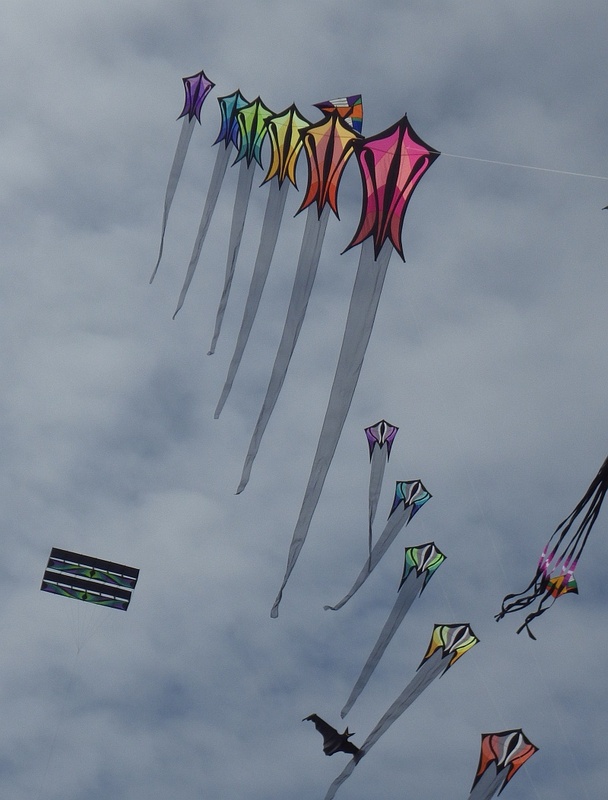 The kite designs vary a lot, from a representation of the Great Wall of China to an exquisite train of glittering miniatures, each one just inches in height. From great long formations of traditional-looking but hi-tech colorful Diamonds to thoroughly modern and intriguing works of art in motion on a single line. 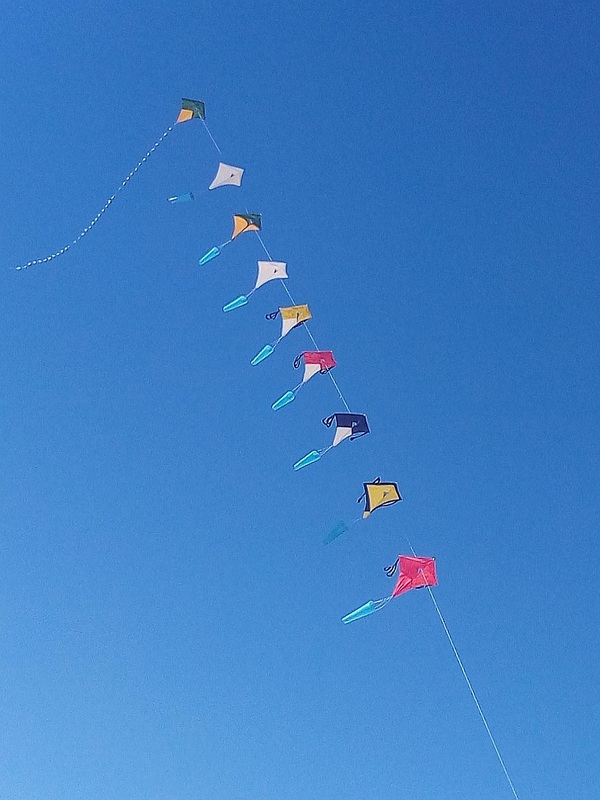 It seems that many expert kite-designers eventually get around to putting a train up, no matter what their specialty happens to be! Modern Retail. 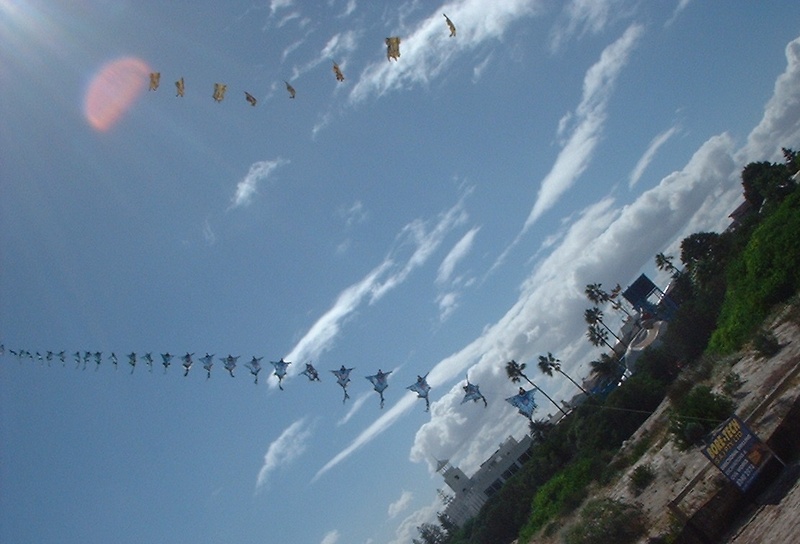 The fact that a train of colorful kites looks intriguing and impressive has not been lost on modern kite-sellers! Hence there are a few products on the market that let you put together sizable trains of small to medium sized Diamond kites. These products tend to be for light-to-moderate winds and feature attractive, professionally-done graphic designs. However, construction materials are at the cheapest end of the scale, in order to make the entire train affordable for casual fliers. 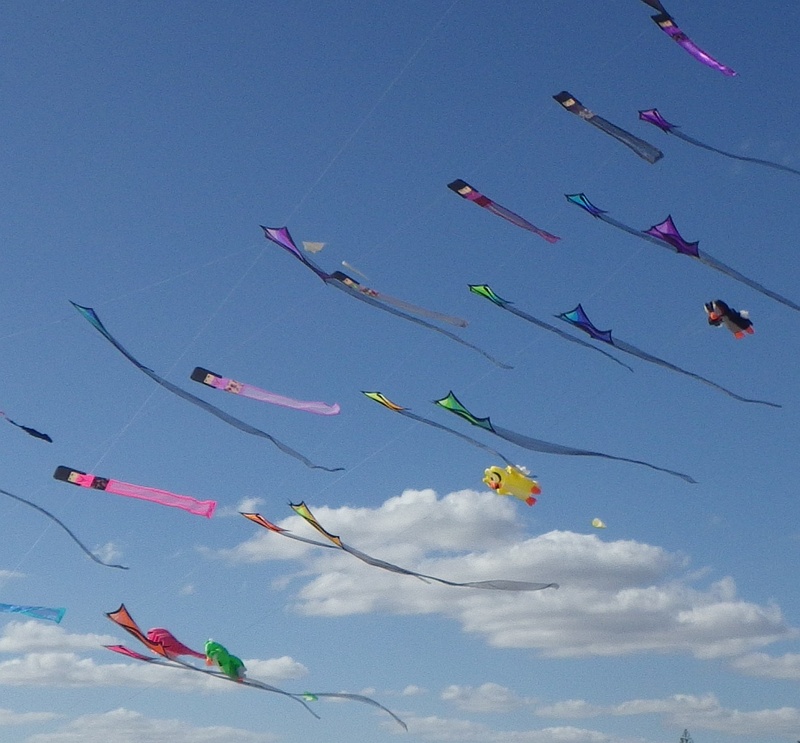 Certainly a lot of fun if the wind is right. 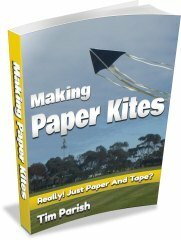 "Love the easy to understand step by step instructions, made from next to nothing materials and above all so much fun to fly... cheers Tim for sharing your well thought out pdf kite designs with the whole world. 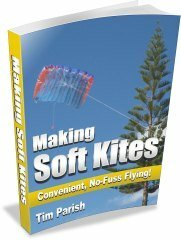 Very satisfying making your own and watching them get air-born for the first time." 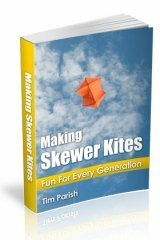 "I decided to run kite making as an elective again on this camp in the past week - so I bought all your e-books, a bunch of materials, and then took a group of 10 high school students through making the kites over 4 days. 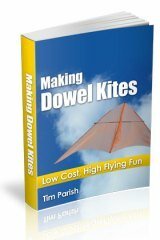 We built a diamond, a Barn Door, a Delta, and two skew delta kites. 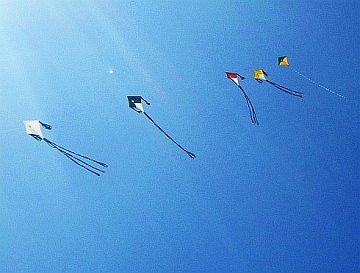 Again - every single kite flew." In recent years, it seems art trains have become more popular with designers. Here are some of the best that we have seen (or made! 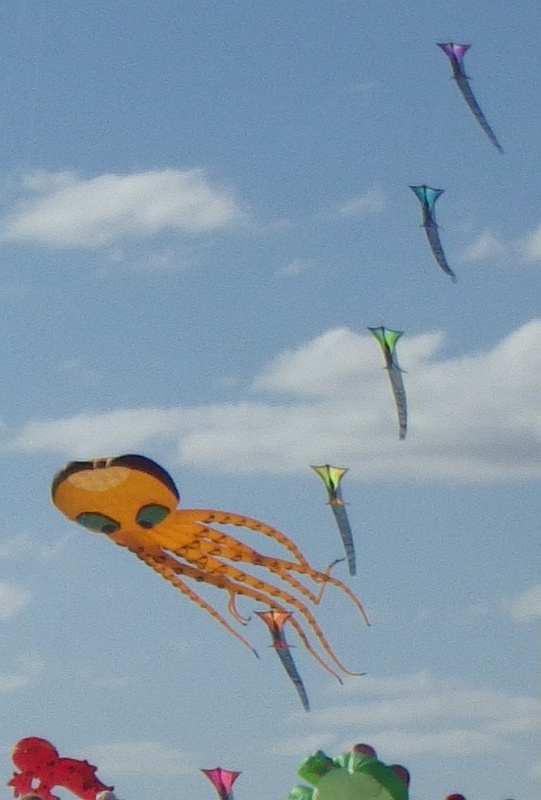 ), at the AIKF (Adelaide International Kite Festival). My own Multi-Fly Diamond design uses a unique approach for more flexibility. 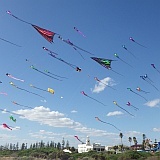 Special fittings allow the line to pass around the kite. Apart from the local festival, I occasionally put up a train of these diamonds nearer home. 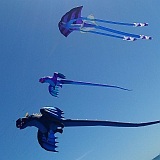 As recorded in these kite train posts.